Up until 1976, it was considered highly unethical for lawyers to advertise and market themselves. 40 years later, things have changed – there’s endless places to advertising your practice (some have even placed ads on condoms or papers used to roll joints). Luckily, the internet has given you options like SEO, PPC and Avvo to market your business in a way that’s more conducive to your brand. 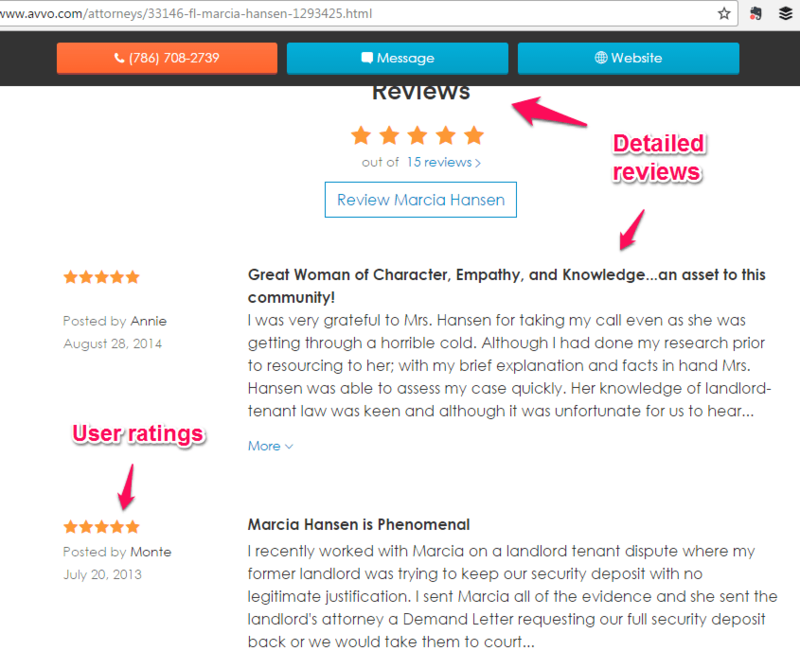 In a nutshell, Avvo allows users to leave reviews (between 1 and 10) about an attorney’s work. Avvo automatically creates a profile with reviews from other sites. The only way you can improve your standing is by claiming it and completing it. 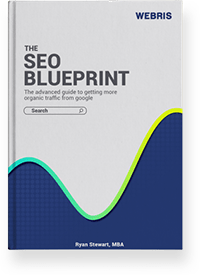 Avvo dominates organic search. A lot of people will be finding (or not finding) your profile and making a decision to work with you or not. Avvo is a legitimate source of legal information. You can answer the questions asked by people who are looking for help with legal issues, and easily establish your authority. 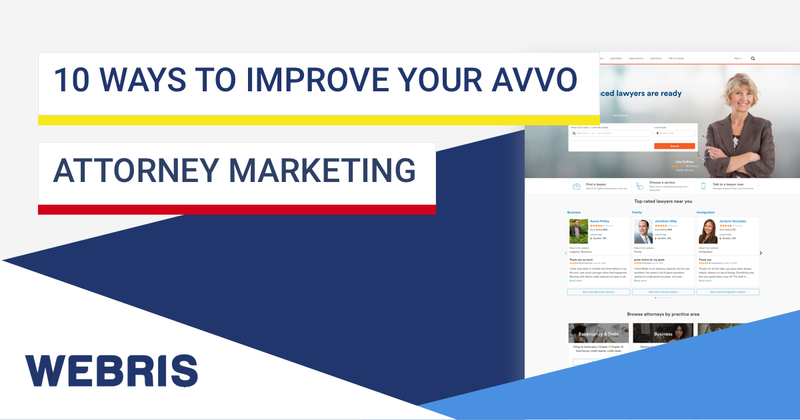 Hopefully I’ve convinced you of the importance, now let’s talk about how to build an optimized Avvo profile. This is a top rated profile on Avvo. Let’s use her as an example of optimization. Multiple options to connect her. While Avvo doesn’t take reviews into account while creating a rating for your profile, good reviews give prospective clients confidence in your abilities. It’s important to solicit reviews to your profile to build that trust and credibility with your audience. Add professional head shots and images of your practice. 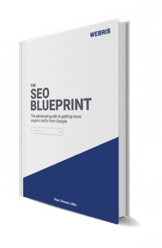 Link out to your website to drive traffic and conversions. 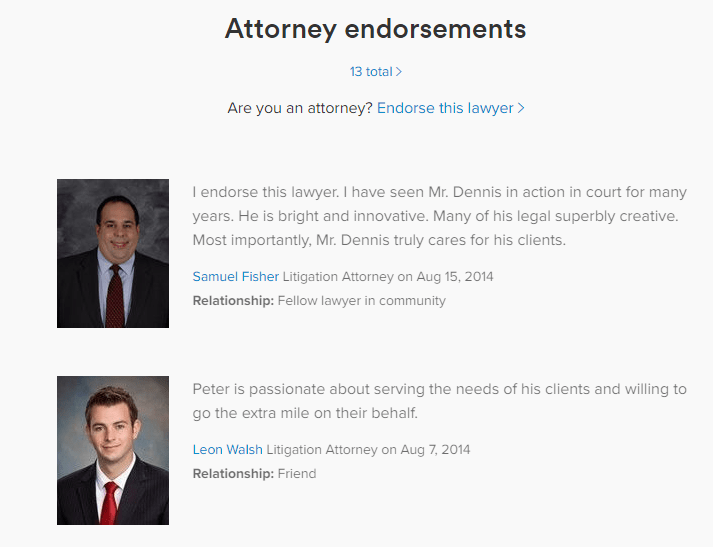 Endorsements are vital because they establish your clout among other lawyers. A lawyer with positive endorsements from colleagues will immediately bring credibility. Payment options let people immediately know how they can work with you. Arguable, the most important part of your profile. This section is where you can truly separate yourself from others – make sure to fill it out. …calculate the rating based on public data we’ve collected on each attorney and the information they have provided in their profile. 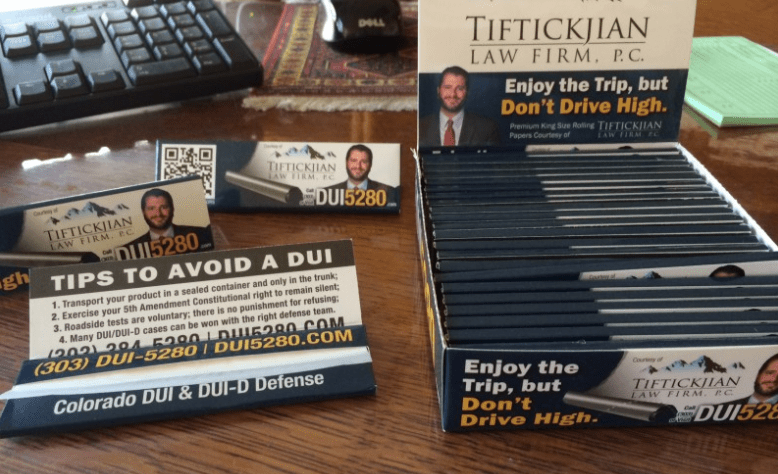 Information not supplied by the attorney comes from a variety of sources, including public records (state bar associations, regulatory agencies, and court records) and published sources on the internet (including attorneys’ websites). Like Google’s search algorithms, Avvo doesn’t share the exact details of how ratings are calculated. However, we’ve done this enough to baseline what needs to be done. NOTE: Check out this Reddit thread where a number of attorneys pooled data to figure out how the algorithm works. 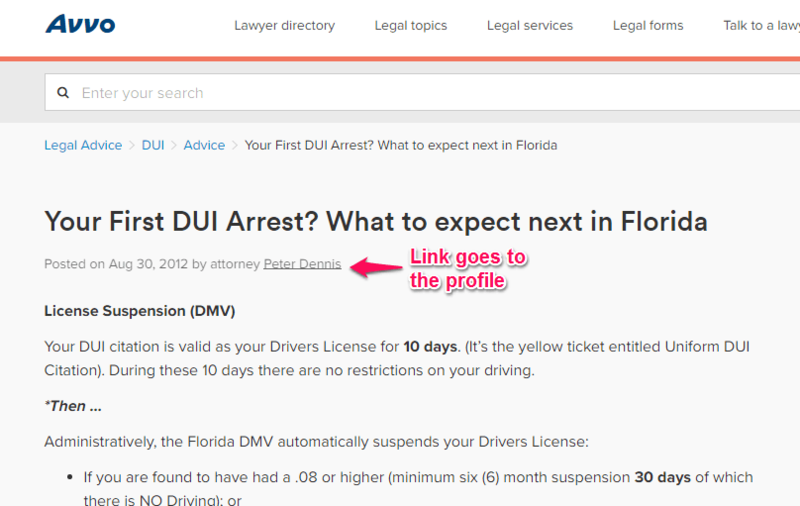 If you’re a lawyer, you will have a profile by default on Avvo. The system fills unclaimed profiles with as much public data it can find from state bar associations, court records or lawyer websites. Unclaimed profiles usually have a “No Concern” or “Attention” rating in most cases instead of the usual numerical rating. However if an unclaimed profile has a system generated rating of more than 6.5 Avvo will display it. Data on your freshly claimed profile might be inaccurate or incomplete. One you are logged in, upload your complete CV, and add details like your specialization, name of school, work experience, number of years you have been practicing law, cases you have fought and awards you have won. Avvo lets you add photos and video on your profile. Add a professional headshot and add a short video introducing yourself to prospective clients. Answer frequently asked questions, and give people a taste of what working with you would be like. 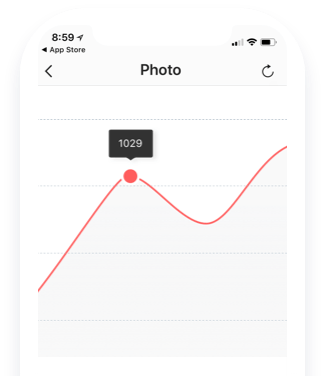 While photos and videos don’t directly contribute to a higher profile, they make it much easier for a potential client to connect with you and are an awesome sales tool. 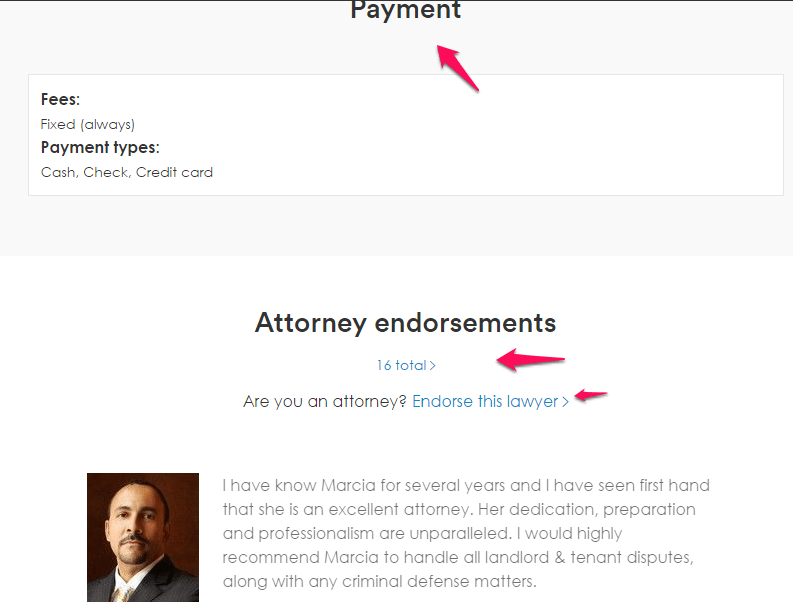 Avvo rewards lawyers who are active professionally with higher ratings. Add any leadership positions you might have held in professional bodies like bar associations. Update a list of articles you might have written for journals or newspapers, or a list of speaking engagements to your name (talks at bar association dinner or guest lectureship at the local community college also count). 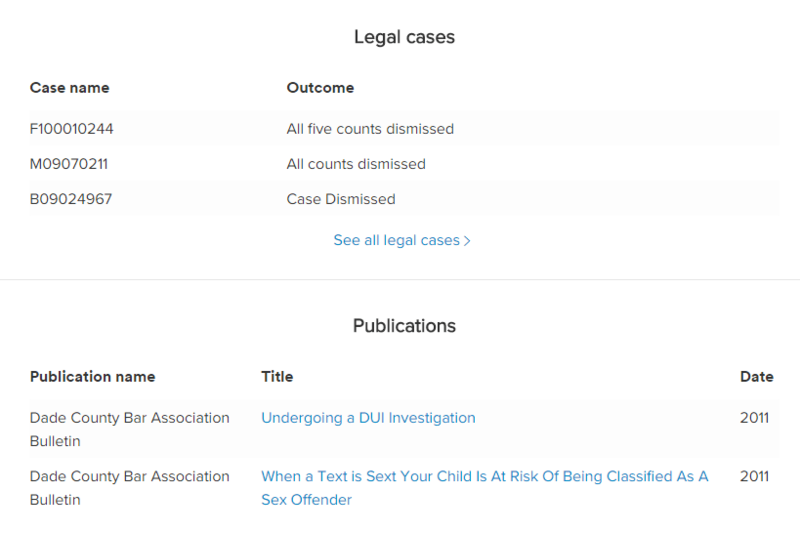 Avvo’s algorithms places more value over your latest cases and/or accomplishments than what you were doing three years ago. If you don’t add dates to an award or a speaking engagement Avvo will automatically assume the oldest date possible, and cause you to lose valid points. Avvo has a Quora like question format, except the questions here are very specific. Your profile can get a major boost if you invest in the time to answer open questions regularly asked on the site. 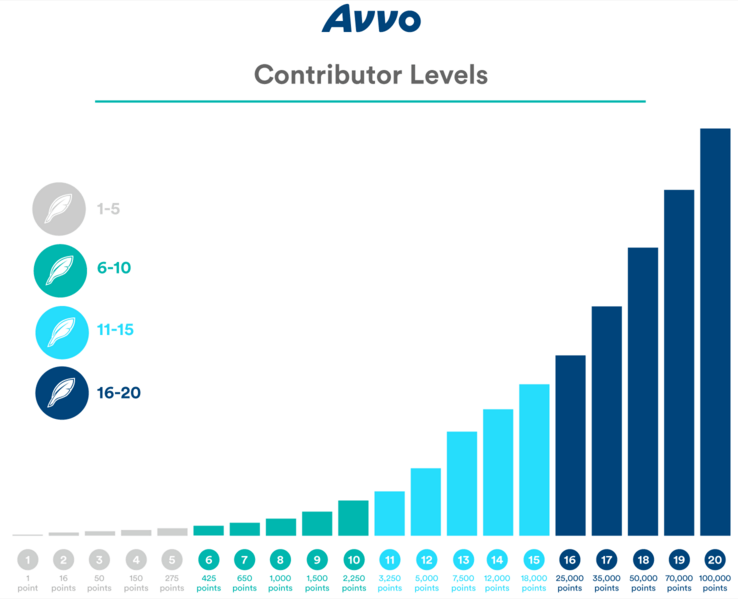 Avvo will award you point based on the type of your contribution. This handy chart shows some activities you can do to boost your levels. The Avvo contributor page has more details. Legal guides are articles offering helpful expert advice for potential clients.The more legal guides you write the higher the chances that your rating will improve. If your piece meets Avvo’s quality standards it can be designated as a Staff Pick and featured prominently on different landing pages inside Avvo, while also ranking high in Google search and giving you even more exposure. Peer endorsements are one of the most important factors which determine your Avvo rating. 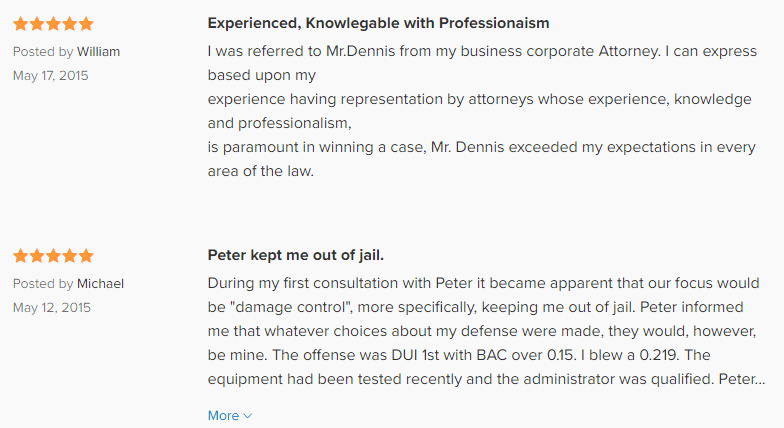 These reviews tell both Avvo and prospective clients how you are viewed by other lawyers. While endorsements aren’t foolproof (a lawyer working at a firm can easily collect tens of endorsements from co-workers) and are susceptible to gaming, the general tone of endorsements do go a long way in reassuring your prospective clients that you aren’t dishonest or unethical and are competent enough for the job. Try to get about 12-14 endorsements for a noticeable jump in rankings. From anecdotal evidence, it seems that endorsements from opposing counsels or sitting judges are especially valuable in improving ratings. When you are claiming your profile, add your current and past licenses so that Avvo can verify your identity. Client testimonials DO NOT influence your Avvo ranking. However, reviews and ratings by past clients do influence people who might be looking to hire you, and not having a testimonial might render a high Avvo rating moot. Unlike platforms like LinkedIn where you can request testimonials from inside the system, you will have to manually request your clients to leave reviews on Avvo. However bear in mind that Avvo doesn’t delete anonymous reviews, or even incorrect reviews. Highly rated Avvo profiles have another similarity: they are frequently updated. Avvo wants to see whether you are an active lawyer or not, and accordingly keeps tweaking the rantings. Regardless of how you personally feel about Avvo your clients love it. With 97% of US lawyers covered by the site, there’s no avoiding it if you want to market your legal practice online. So, join them, and THEN beat them.